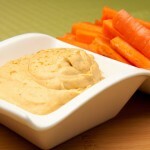 Healthy hummus recipe made with pureed roasted vegetables and chickpeas. Heat 1 tablespoon olive oil in a frying pan [I like to use cast iron]. Once heated, add onion and garlic and sautée for 2-3 minutes on medium heat, mixing every minute or so to avoid burning. Add celery, carrot, and red pepper. Cover and cook on medium-low heat for 4-5 minutes until carrots are tender. In a blender combine reserved liquid, lemon juice, tahini, and olive oil. Top with sautéed veggies, potato, chickpeas, and salt. 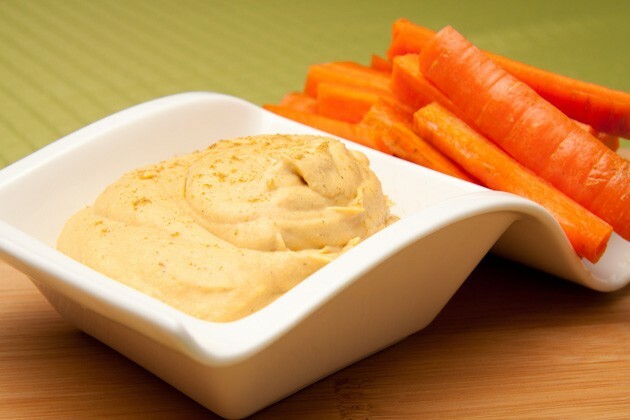 Garnish with cumin and serve with crackers or vegetable sticks.